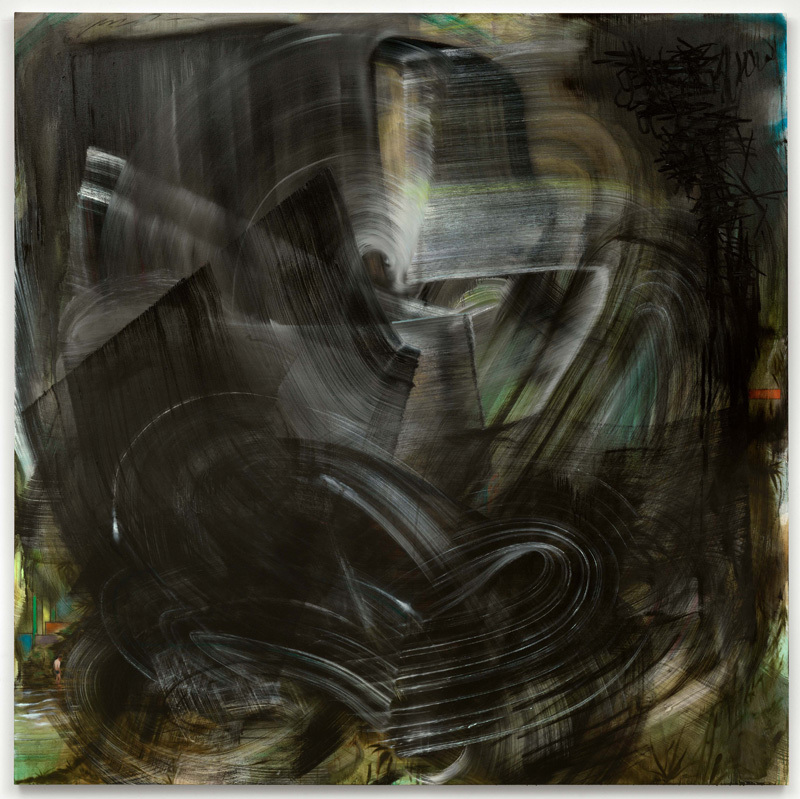 Recently opened at Andrea Rosen Gallery in New York is an exhibition of paintings by artist Nigel Cooke. The show consists of large scale oil paintings spanning a date range from 2011-2012. Each painting has a signature feel, a marker or map of the artists hand and presence in space. There are broad sweeping movements that are blurred swipes of motion, obscuring what may lie underneath. In some paintings these areas dominate, while in others there are areas of representation. Several symbols find themselves repeated in various canvases and in various stages of reveal and conceal. A dominant character/form in the paintings is a skeleton-like clown with a bright, blue nose. This figure merges two worlds between entertainment and horror. However, the viewer will bring his/her own experience to the work as well as associations. Cooke, who is originally from Manchester, England is very aware of the physicality of painting along with the symbology and weight carried with execution. He chooses to focus on the paint itself, interweaving elements of abstraction and representation. The results are in the current exhibition and while some are more impressive then others, they all require a certain amount of time in order to attain a glimpse of what is going on inside the mind of the artist. Some of the symbols seem silly while other markings are quite advanced. A viewer must spend time with the work before establishing a specific opinion or reproach. In almost each one of Cooke’s painting a figure is nestled somewhere in the scope of the tightly wound composition, nestled between fluid and purposeful abstraction. Such is the case with Widow, 2011 a square format painting featuring large, grey swooping swirls. The marks could be equated to the shapes that are formed after cleaning a dirty window with a squeegee. However, if one is willing to bend-over, squint, and and possibly get his/her feet wet, the microscopic detail of a man in his swimming trunks, flanked by some geometric shapes that liken to the work of Mondrian or the stained-glass of Frank Lloyd Wright. The effect is somewhat dizzying but upon leaning into the surface, one can easily see the aesthetic beauty the artist tends to despise yet also crave. His is a painters journey, the struggle one feels with a brush in hand and a long history behind. What is contemporary painting really about? It’s about re-establishing boundaries and attempting to say something that hasn’t been said before. Painting is about communication through mark making, it’s tribal and raw and chaotic even in it’s moments of proposed organization. When asked during the press preview about his surface level marks, which are the most gestural, this was Nigel Cooke’s response. Painting for most, especially those trained with a nod towards traditional, figurative oil works, is a difficult yet fulfilling journey, one that will always offer new and enticing challenges. Moments of success and failure, both psychological and actual, are evident in Cooke’s work. Go, and decide for yourself.Nigel Cooke is on view at Andrea Rosen Gallery from March 31st-May 12th 2012.